Born in Namur in today’s Wallonie, Arcadelt celebrated successes during his lifetime above all with secular music and today is regarded as one of the founders of the Italian madrigal. It is little known, however, that he invested a not insignificant amount of his creative energy in sacred music and did so as a singer-composer in the Cappella Sistina whose significance in the stylistic development of its repertoire is not to be underestimated. 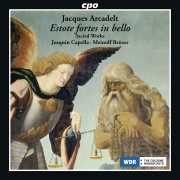 The Lamentations occupied a special place in the repertoire of the Cappella Sistina, and Arcadelt set these highly expressive texts with deep, dark male voices, weaving them together with fine polyphonic artistry to produce music of solemn gravity.